Network functions virtualization (NFV) has matured to the point where the majority of network functions can be hosted on Intel architecture-based servers. 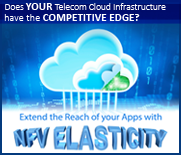 A single virtualized system hosting an NFV infrastructure (NFVI), network orchestration,and virtual network functions (VNF) can replace the multiple dedicated pieces of customer edge (CE) equipment needed for local and wide area networking. This is leading to the expanded use of virtualized universal customer premises equipment (uCPE) networking systems that can deliver branch office networking functions with the capacity for additional VNFs that let communications service providers (CommSPs) deploy custom, value-added services. Kapsch CarrierCom, a Kapsch Group company, is a global producer, supplier,and systems integrator of end-to-end telecommunications solutions. Kapsch CarrierCom chose Advantech as its CPE hardware vendor, and together they have developed a comprehensive network customer deployment solution leveraging software contributions from an ecosystem of software vendors, including Cloudify, the TOSCA-based provider of management and orchestration (MANO). The virtualized uCPE future-proofs networks, providing a computing environment for the introduction of new networking techniques and optimizations. Software defined WANs (SD-WAN) are the most interesting of these services, facilitating traditional WAN services for access to corporate applications, and broadband Internet services for connection to cloud services. Elegant service chaining of VNFs,including cloud-based elements, can be efficiently implemented in the uCPE. The uCPE, sometimes also referred to as a virtual CPE (vCPE) or virtual enterprise CPE (vE-CPE), offers economic benefits as the number of physical CPE devices required for branch office networking is significantly reduced. Operational expenditures can likewise be significantly reduced through simplified operations, maintenance, and updates.Network functionality can be updated and augmented on the fly, allowing the enterprise to add services in real time as they are needed. Advantech offers a range of uCPE hardware platforms to meet the needs of small, medium, and large enterprise branch offices. 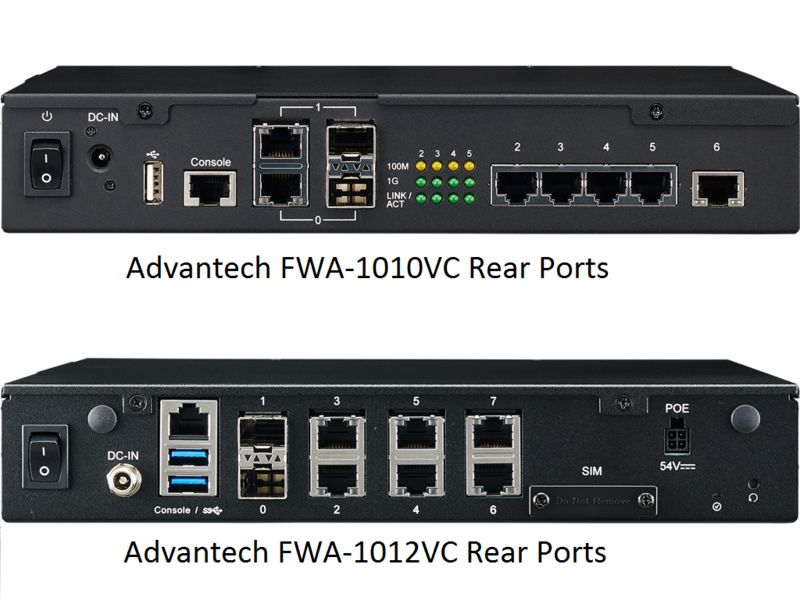 The Advantech FWA-1010VC and FWA-1012VC are off-the-shelf, table-top CPEs that are designed to handle small to medium locations. The FWA-2320 and FWA-2012 are 1U rack-mounted versions designed for larger enterprise offices and provider edge installations. The models mentioned above use Intel Atom® processors C2000 or Intel Atom processors C3000 with two, four, or eight cores and up to sixteen cores on the FWA-1012VC. Each system supports flexible RAM capacities with error correcting code(ECC), multiple solid state drives (SSD) via SATA and/or M.2 interfaces for reliability and high availability, and a wide range of integrated gigabit-Ethernet and 10 GbE ports with both copper and optical SFP connections depending on the model. The FWA-1010VC and FWA-1012VC offer an optional integrated Wi-Fi access point and 4G/LTE connectivity. 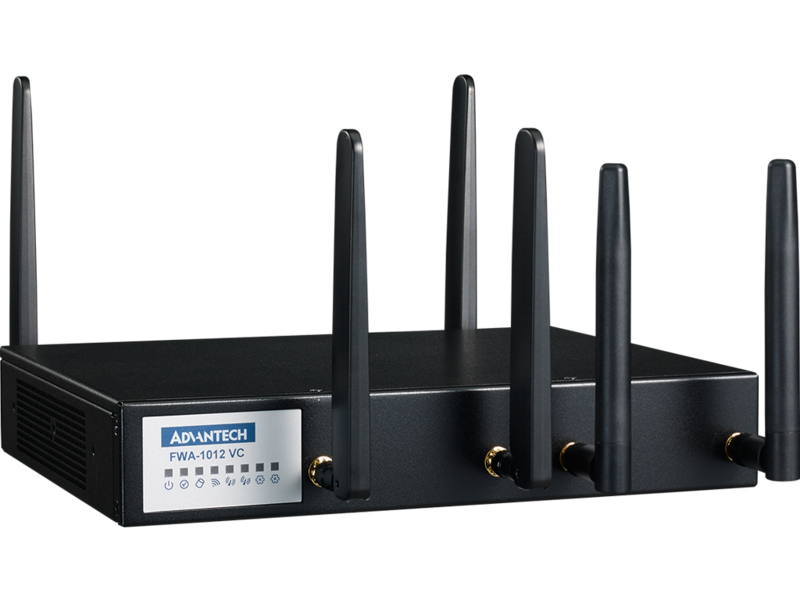 The4G/LTE option can provide failover protection for the primary WAN connections and can also be used for higher bandwidth bonding with the wireline WAN ports. In addition, the FWA-1012VC offers optional dual-SIM capability for active/standby and an optional cost saving PoE module that canpower two IEEE PoE+ (25.5W) ports without the need for a PoE+ switch. All models include an optional trusted platform module (TPM) that acts as the root of trust for security certificates. Data Plane Development Kit (DPDK) – the open source DPDK software library routes network packets around the Linux* OS kernel and vSwitch. Coupled with poll-mode network drivers and an optimized run-time environment,DPDK is designed to enable fast packet processing performance. Intel® QuickAssist Technology (Intel® QAT) – employs a hardware-assisted engine to accelerate data encryption and data compression functions. Kapsch CarrierCom requires carrier-grade CPE hardware with a long life cycle and high meantime between failure (MTBF).The CPE must be based on Intel CPUs to ensure widest compatibility with third-party VNFs. The CPE should also be available in multiple and custom form factors. For the software stack, Kapsch CarrierCom developed a partner ecosystem in order to work with the outstanding NFV software component providers as well as popular VNFs. Network and customer orchestration is of particular concern. The solution developed by Kapsch CarrierCom was designed with full multitenant capabilities built around an extensible framework and offering an industry standard API for customization. 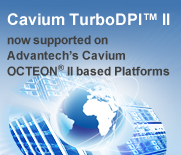 Advantech was chosen to supply the CPE hardware in different sizes to support small, medium, and large customer premises.As a multinational organization, Advantech had the required worldwide presence. Its equipment also met strict mission critical requirements. Figure 2 shows the proposed overall architecture. Kapsch CarrierCom selected VeloCloud* Cloud-Delivered SD-WAN for wide area network (WAN) availability and performance. OneAccess* satisfied the vCPE requirements for an open virtual platform (OVP) and virtual router(vRouter). Cloudify supplies orchestration, both CPE-based and cloud-based central management. Kapsch CarrierCom has built a catalog of compatible VNFs that can be downloaded from the orchestration system to satisfy individual customer site requirements. Fortinet* VNFs, for example, can be used for network security. 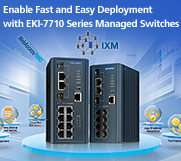 Kapsch CarrierCom and Advantech spent considerable time validating this architecture to ensure functionality, scalability,and maintainability. An overview of the validation network is shown in Figure 3.In the tests, two pseudo customers, Customer A and Customer B, are supported. Each has a private office with its own CPE, and both share a third CPE in a CommSP datacenter, leveraging edge multitenancy. Both broadband Internet and dedicated multiprotocol label switching (MPLS)links connect all three CPEs. All three of the CPEs are controlled and supported by the VeloCloud Orchestrator (VCO). Each CPE runs a VeloCloud SD-WAN instance that is controlled from the pair of VeloCloud orchestration wireless backbone (WB) systems.The WBs use a local high- availability link with rapid failover. All customer LANs are accessible through any of the CPEs. Embedded network functions such as DHCP and NAT. Virtual machine (VM) creation through the management web interface. Deploy the VeloCloud Edge (VCE) on the uCPE’s OVP. Register a new virtual network edge (vEdge). Connecting the VCE to the VCO hosted in the public cloud. Setup of an SD-WAN overlay between two VCEs running on two different CPEs. Validation of uCPE high availability and service continuity during a uCPE failure. NFV has had a dramatic effect on branch office networking, providing an opportunity for new technology, new deployment techniques, and new network management schemes. Kapsch CarrierCom has developed its complete solution composed of universal CPE equipment, based on Advantech white box hardware using Intel hardware and specialized software from a community of vendors.Combined, these elements help CommSPs reduce networking costs, improve performance, and deliver new revenue-generating services optimized to each customer. If you would like to download a pdf version of this Solution Brief please click here. Learn more about the Intel Network Builders ecosystem members and their technologies that contribute to this solution.